Thursday we jumped on a bus and drove 6 hours east of Prague to get to Ostrava. We are here to attend the Ostrava Rails Conference for the next two days. To those of you who dont know Rails it is a programming framework that is talked a lot about these days and it is one of our primary tools. So when we discovered that this event was on we decided to check it out. The bus system here is amazing. We paid 1160czk for two return tickets on an air conditioned bus with leather seats, showing movies and Friends episodes and complimentary copy of the days newspaper or Maxim. On our first venture in Ostrava we jumped on the tram to take it two stops and figured we could do that without buying a ticket. Bad idea. 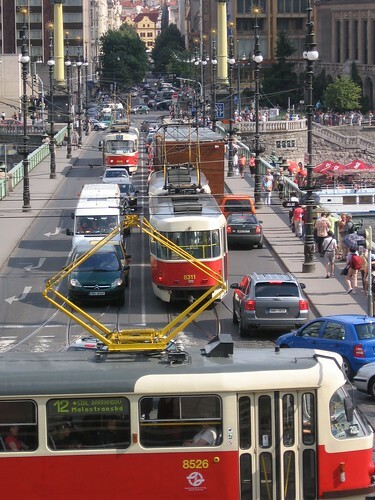 As soon as the tram started roling a ticket officer busted us and we had to pay a 400czk fine each – doh! I contacted a couple of people on CouchSurfing to see if somebody had couches we could crash on and thats how we ended up meeting Petr. Or we havent actually met Petr yet. He wasnt home but he got Zeno – his flat mate and landlord – to let us in so that we could sleep on his floor. Zeno is a photographer and cinomatographer and the flat were staying in is also his studio. The rest of the evening we spend with Zeno drinking whiskey – good times. Our goal of starting our own company has been to enjoy life and gain experiences while making money building software that works. We started this company to let us try something we probably wouldn t experience if we were working for an employer. After setting up the company and working in Copenhagen for about 8 months we realized that it is not crucial for us to be stationed in Denmark to work for Danish clients. We had Danish clients but also clients we d never met and who were sitting in US, UK and Germany. We were web workers and all we needed was (roughly) a chair and good Internet and we could do our work. When we truly realized this fact and our lease in Copenhagen was nearing an end, we started to look at a map – in the beginning just for fun – but quickly it became apparent that we had to try to move to a different country. We settled on Prague for a number of reasons – cost of living is cheaper (since we are still paid by Danish rates), trains and flights are frequent and cheap to Denmark and the rest of Europe and finally Prague is a beautiful metropolis with a thriving night life. Our plans for our Prague adventure is to stay here for six months as a  work holiday  where we can get more value for our buck while we focus on developing products for other companies and one of our own products. Arb Design the company is still based in Denmark in terms of tax, VAT – it s just the two owners that are sitting in Prague for a while. – After explaining this some people said  I guess it makes sense in a way  or  I wish it was me  – and a few continued to shake there head. We have now been in Prague for nearly three weeks and moved into our new apartment Sunday and it already feels like home. At times we have asked ourselves whether or not it was a good idea to make this move – now I know it is.